African Lion, the annual training exercise between Morocco and U.S., is underway right now. The exercise is led by Marine Forces Africa and sponsored by U.S. Africa Command. The training includes command post, live-fire and maneuvering, peace keeping operations, an intelligence capacity building seminar, aerial refueling/low-level flight training, as well as medical and dental assistance projects. Here’s a recap so far, by the numbers, with links to related stories and photos. The first year of African Lion was 2008. Each year, African Lion has been hosted by Morocco, which has about 32 million people. 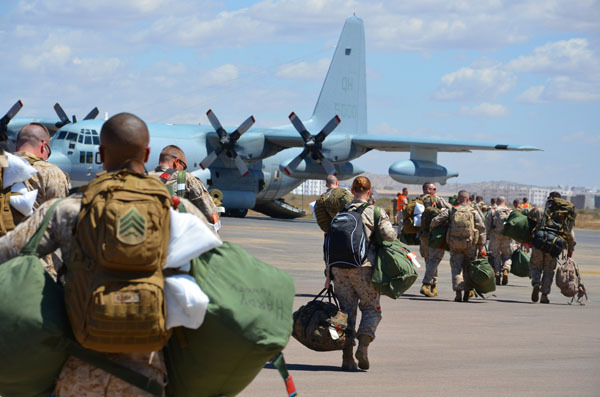 This year, more than 1,000 U.S. military personnel, including about 800+ Marines, and 900 Royal Moroccan soldiers are working together during the 10-day exercise. To support the mission, U.S. Marines offloaded 169 pieces of rolling stock assets in under 12 hours at the Port of Agadir. A four-day Intelligence Capacity Building Workshop helped prepare senior staff officers from both countries who will participate in the Command Post Exercise portion. Marines are using a Tactical Water Purification System, which weighs 10,000 pounds, to purify approximately 10,000 gallons of water a day by pumping it through a series of filters. The water supports the soldiers involved in the training exercises. Four Rapid Response Kits allowed the military to get up and communicating quickly. About 70 medical and dental staff will help treat 1,000 local patients daily as part of the humanitarian civil assistance project of African Lion. On a quieter and tragic note, we can not overlook the two Marines who were killed and two Marines who were severely injured in an MV-22 Osprey crash earlier this week during African Lion 12. Our thoughts go out to the families. The crash is currently under investigation. African Lion 12 ends April 18, 2012. For more on African Lion, visit the U.S. Africa Command website. U.S. Africa Command is responsible for military relations with 54 African countries across the continent. Morocco is one of the northernmost, located in West Africa, bordered on one side by the North Atlantic Ocean and by Algeria on the other. This month Morocco is host to African Lion, a Marine Forces Africa partnership exercise that focuses on air and land combat. Population: About 32.3 million people live in Morocco. Of 238 countries listed in the CIA Factbook, Morocco ranks 38th in size. Languages: Arabic is the official language, but French is also widely spoken, especially in government and business. The indigenous Berber dialects are also spoken. Politics: Hereditary monarchy with a prime minister chosen from the largest party in parliament. In the wake of the Arab Spring last year and protests in his country, King Mohammed VI agreed to some constitutional reforms. Geography: Morocco covers about 446,000 square kilometers and is slightly larger than the size of California. The northern coast is mountainous and prone to earthquakes. Strategic importance: The country sits on the Strait of Gibraltar, an important trade route that allows ships to pass from the Mediterranean Sea directly to the Atlantic Ocean. At its narrowest point, the strait separates Europe and Africa by just 8 miles. Border controversy: Morocco claimed sovereignty over the former Spanish colony of Western Sahara, to the south, in 1979, prompting a guerrilla war that ended in a 1991 UN-brokered ceasefire. A referendum was promised to decide Western Sahara’s fate but so far has not happened. U.S. Partnerships: African Lion, currently taking place in Morocco, is the largest bilateral exercise on the continent. You might know it because: Morocco is home to the city of Casablanca, made famous in America by the iconic 1942 film named after it. The movie was not actually filmed in Morocco, but on studio sets in California. Some 1,000 U.S. service members are in Morocco this month for African Lion, the largest bilateral military exercise on the African continent. Sponsored by U.S. Africa Command, the annual exercise is a partnership between Marine Forces Africa and the Royal Moroccan Armed Forces. Participating units include 3rd Battalion, 14th Marines, 4th Combat Engineering Battalion, 4th Light Armored Reconnaissance Battalion, 1st Battalion, 24th Marine regiment infantrymen, 4th Combined Anti-Armor Team and 4th Marine Logistics Group, plus multiple sub-units. More than 900 Royal Moroccan soldiers will join U.S. military personnel in the exercise. The bulk of Africa Lion takes place over the next two weeks. Highlights include field and aviation training, amphibious assault training and humanitarian and peacekeeping training. 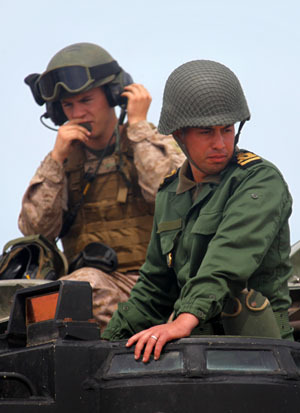 U.S. and Moroccan forces will conduct arms fire and maneuver ranges and aerial refueling and deliveries of supplies, as well as command post and non-lethal weapons training, according to a press release from U.S. Marine Corps Forces Europe. Six different locations around Morocco will be involved. African Lion will also include medical, dental and veterinarian assistance projects. Medical professionals from Utah Army National Guard and 4th Medical Battalion, 4th Marine Logistics Group, expect to assist thousands of local residents and provide more than 1,600 prescription glasses to Moroccan children, according to the African Lion lead medial officer. The first African Lion exercise took place in 2008. This year’s exercise took about six months to plan. Look for much more coverage on our website, Facebook, and Twitter sites this week.